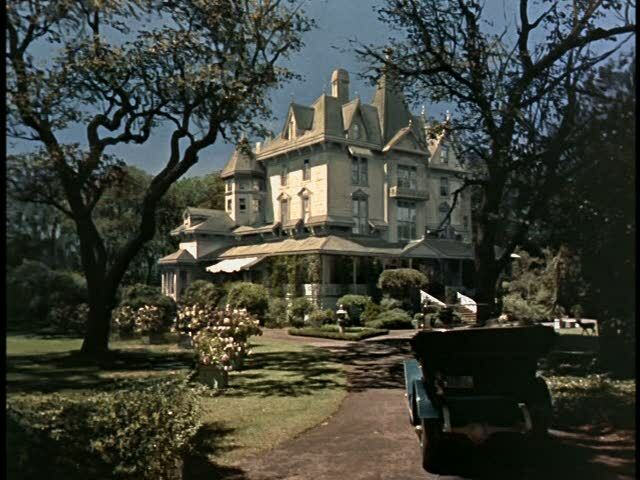 Creating the Grand Victorian Mansion for the Disney Classic "Pollyanna"
When I was in grade school, we watched the Disney movie Pollyanna on a giant screen in the gymnasium. I loved the house so much that for years I fantasized about growing up to live in one just like it someday. 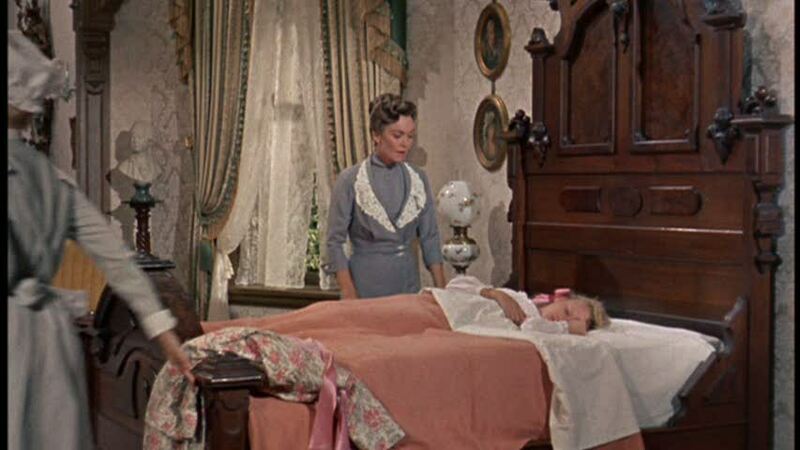 I also liked the positive, feel-good message of the movie, and how Pollyanna changed so many lives in the small town. 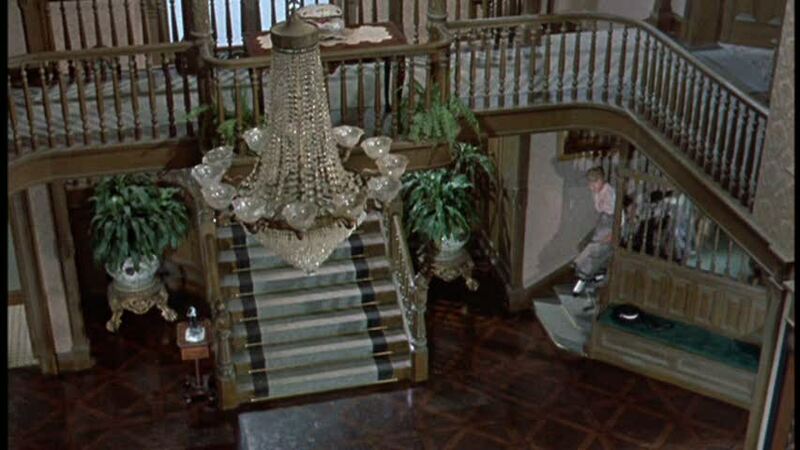 I hadn’t seen the movie in years until a reader sent me a photo of the real house used in it. It led me to watch it again, and the sets did not disappoint. They were just as wonderful as I remembered. 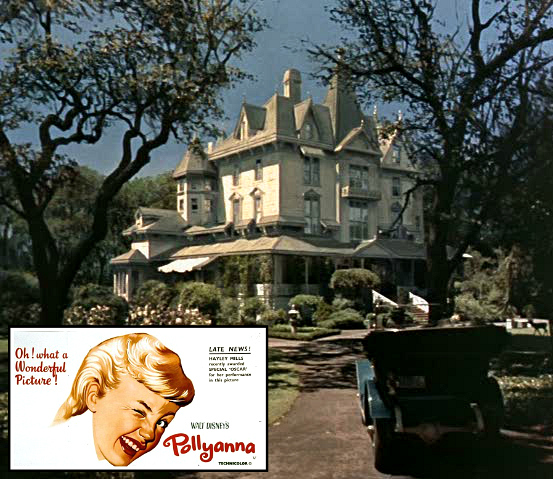 After 11-year old Pollyanna is orphaned, she goes to live with her stern and humorless Aunt Polly (Jane Wyman), who lives in this three-story mansion. The movie was based on the 1913 novel by Eleanor H. Porter and takes place in 1910, so the filmmakers faced the challenge of recreating the era. 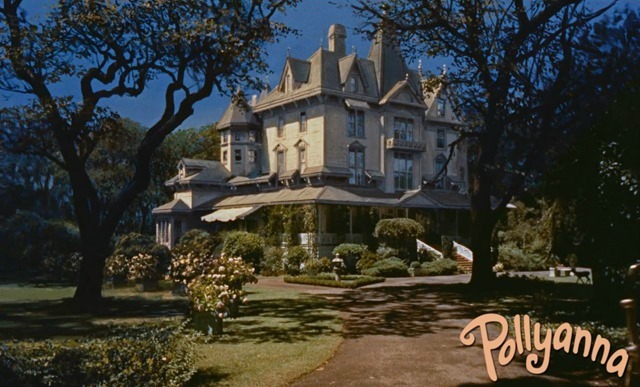 They decided to film in Santa Rosa, California, but couldn’t find a three-story house that would work. The solution? A little Hollywood magic. 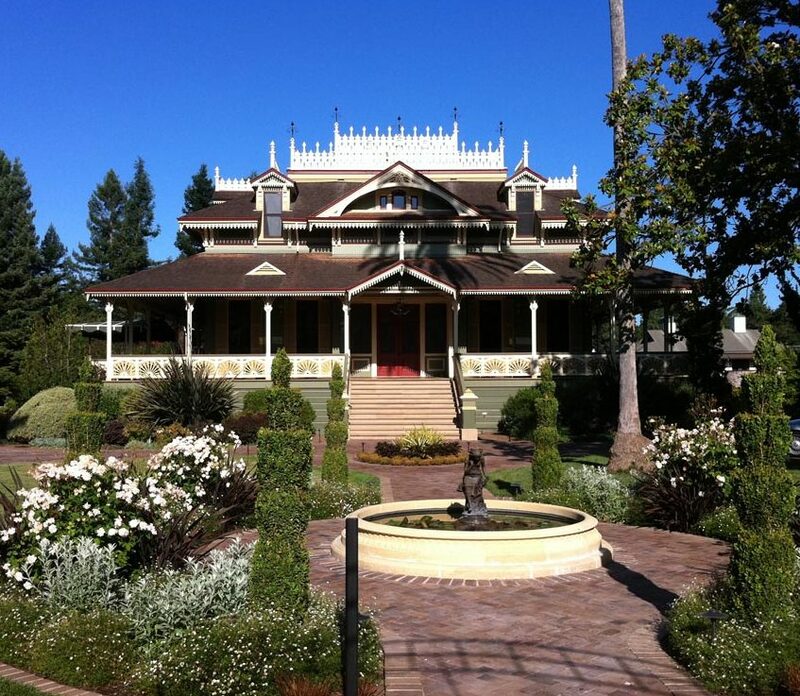 It’s known as the McDonald Mansion and was built in the late 1870s by Col. Mark Lindsay McDonald, owner of Santa Rosa’s water company. According to About.com, the Stick-Eastlake style was meant to evoke the plantations along the Mississippi. 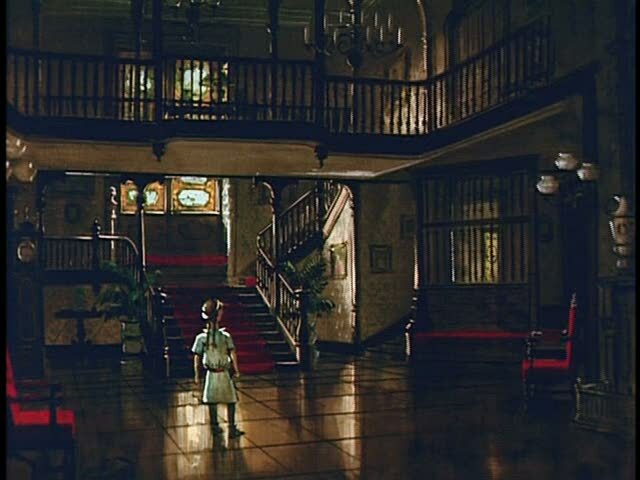 Hayley Mills says she had a great time running around and exploring the elaborate sets between scenes, adding that there were several rooms that they never even filmed in. The screenplay was written by David Swift, who came from an animation background. 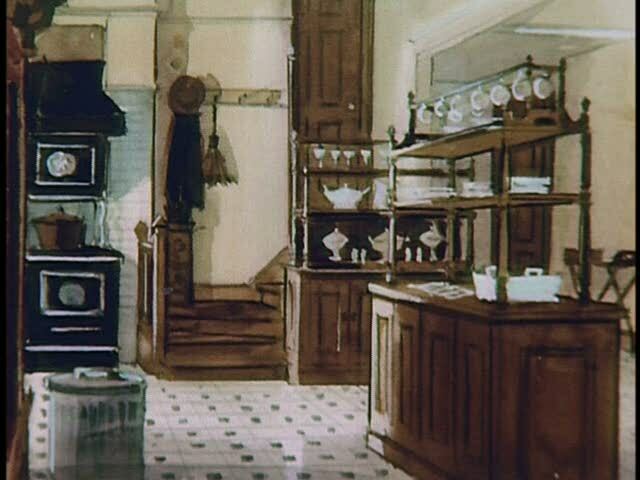 He painted illustrations of how he envisioned the houses and various sets to look (via the DVD special features). It’s amazing how closely the sets resembled what he imagined. Over 300 girls auditioned for the role of Pollyanna. Panic was setting in as they couldn’t find the right actress for the part. Then Hayley Mills was spotted in a British film called Tiger Bay and brought in at the last moment, just as another actress was about to be signed. It’s hard to imagine the movie with anyone else in that role. Pollyanna grew up in a poor missionary family. 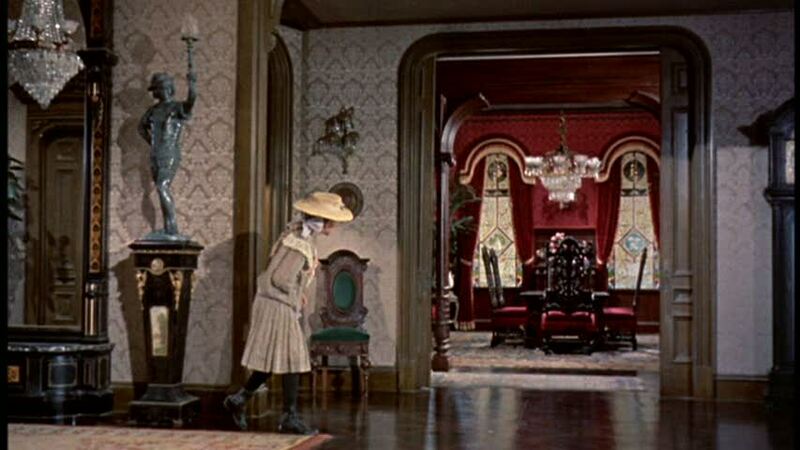 We are introduced to the mansion from her point of view and can imagine how overwhelming it must be. If you’ve seen it, then you know the movie tends to go on and on. It wasn’t just because people had longer attention spans in 1960, however. Director David Swift says that even he thought it ran too long and wanted to edit a lot of the scenes to pare them down. But Walt Disney loved every minute of it and refused to let them cut a thing. Was this one of your childhood favorites, too? You can watch it here. Hayley Mills says that she learned life lessons from it that stayed with her today about being positive in the face of adversity. The Old Stone Farmhouse in "Marley & Me"
I loved this movie! And this was fun to find out the real story behind the real house! I don’t think I have ever seen this movie in its entirety (perhaps because it is so long?) but I think I need something cheery so I’m adding it to my Netflix queue. PS I like the original house much better! .-= Robin´s last blog ..Croc-a-doodle-doo =-. I did so love this movie as a little girl. Especially the prisms they hung all around the old man’s house! I must admit to being a bit more careful in my tree-climbing after seeing this, however. .-= Pamela´s last blog .. =-. Great post. 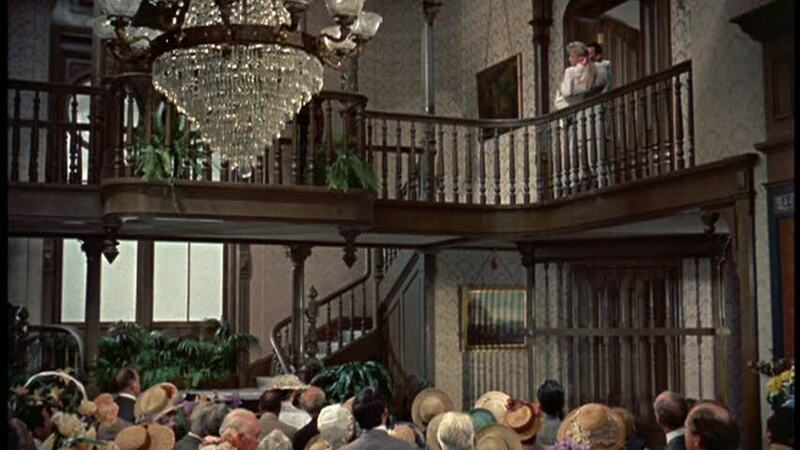 Beautiful house and sets. It’s so much fun to be able to see them like this. .-= karen´s last blog ..I am having a flea market on Etsy!!!! =-. My Mom refers to this movie occasionally, it is good to have some reference to it finally! .-= The Blushing Hostess´s last blog ..Pattern Spotlight: Trellis, Vera Wang for Wedgewood =-. I have this movie and love it! It’s one of my favorites. I watch it when I’m upset or sad or out of sorts. I love the time period it’s filmed in. I have to say that you’ve ruined my illusions about the house! I always paused it on the shot where they pull up to they house just so I could stare at it and imagine what room went where. I always thought there was a real house out there. Now I’m devastated, LOL! I’ll have to pull Miss Pollyanna out again soon and watch her! .-= Dagny @ Beautiful Living´s last blog ..A sneak peak!! / En liten sniktitt! =-. How fun! Such memories! I will have to rent this one! .-= Boysmum2´s last blog ..Win =-. 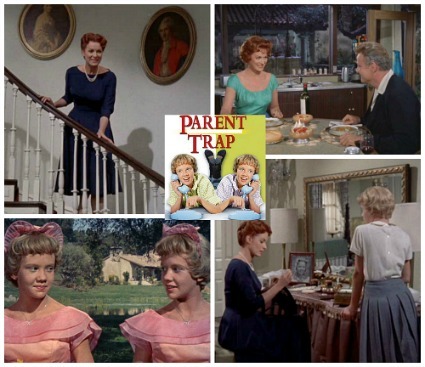 I DO remember seeing the Parent Trap with Hailey Mills and loving it so I bet I would have liked Pollyanna too 🙂 Love seeing this post and have to look for the movie on dvd . .-= Marian´s last blog ..ELVIS presents from the USA?? =-. I loved this Movie and always loved Pollyana’s optimism, I have the DVD so will have to have another viewing and take more notice of the house nothing beats a feel good Movie. .-= Jacki´s last blog ..Something to look forward to =-. It’s amazing the things they can do – I can’t believe those floors were painted on. .-= Kathy´s last blog ..Books Bought =-. .-= Susie Harris´s last blog ..Wooden Rulers make the best projects! =-. I used to love this movie as a kid! I can’t believe the actual house they used and how they “transformed” it. Thanks for the tour! .-= Britt´s last blog ..Yard Sale Finds! =-. .-= rue´s last blog ..Going to Mayberry Jr.’s fair…. =-. ooh now I’m going to have to go watch this movie! I haven’t seen it since I was a lil girl! Thank you so much for all your posts!! I’m addicted! .-= Becky @ Farmgirl Paints´s last blog ..The Dog Whisperer =-. I loved this movie as a little girl. Now I want to watch it again! .-= Ms.Tee´s last blog ..Pretty Table on a Budget =-. 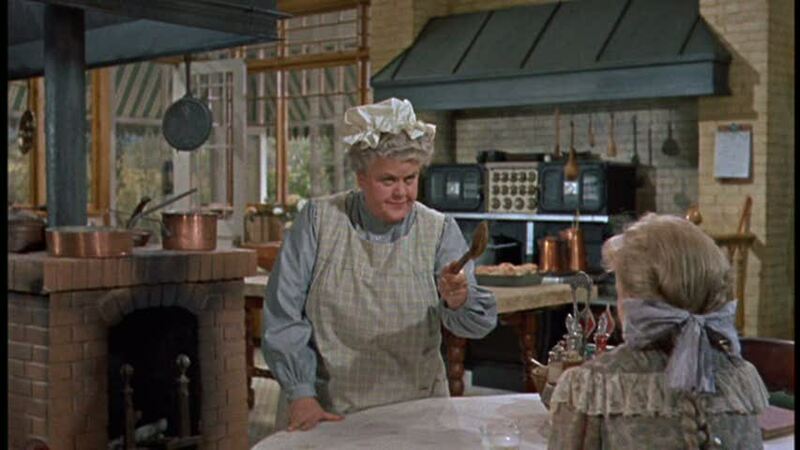 I have been accused of being a “Pollyanna” as if it’s a bad thing! And I know the story, but I’ve never seen this movie. I should rent it and make a certain person sit with me to watch it so “he” (I’m not saying who) can see that having a positive outlook is actually okay! .-= Tracy´s last blog ..Let’s Play "Lamp Shade Switcheroo"! =-. I loved this post. It brought back lots of warm and fuzzy feelings. Those Victorians are just so amazing. Thank you Julia. I love this movie *so much*. I haven’t seen it in years but I’m going to rent it and watch it with my 8 year old. Really, I got teary eyed just looking at the pictures. .-= Amy´s last blog ..Ooh, Pretty! =-. I adore this movie! I remember the first time I saw it on TV in the 70’s – big bowl of popcorn on the floor with my brother! It made a big impression on me. 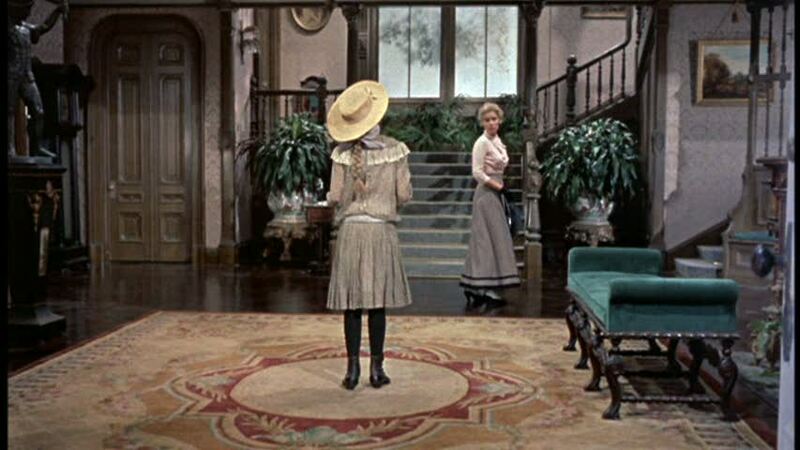 I wanted to live in a Victorian house, wear pretty, detailed dresses and hats. I wanted a friend like Jimmy…I wanted to win a doll at a carnival! After Pollyanna I saw Parent Trap and Summer Magic. My mom told me that Pollyanna’s real name was Hayley. The name Hayley stood out in my mind as the prettiest, most unique name I had ever heard. When it came time to choose a name for my first daughter all those years later…Pollyanna, Susan, Sharon or Nancy just wouldn’t do…I chose Hayley and spelled it just the same way!! .-= Christy´s last blog ..A Summer Tote… =-. David Swift’s illustrations are remarkable! 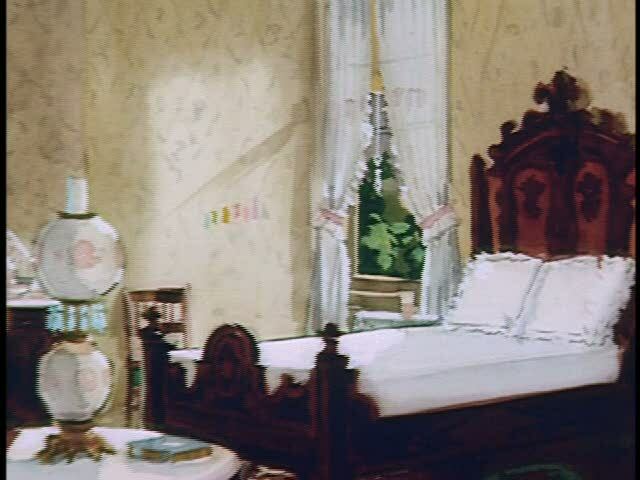 The sets are very close to what he envisioned–maybe a little more elaborate (the bedroom). What a talented man–writer, designer, artist! .-= susan´s last blog ..Pink Saturday…It’s Jessies’s Birthday! =-. .-= tracey´s last blog ..Fall Fashion Fever =-. 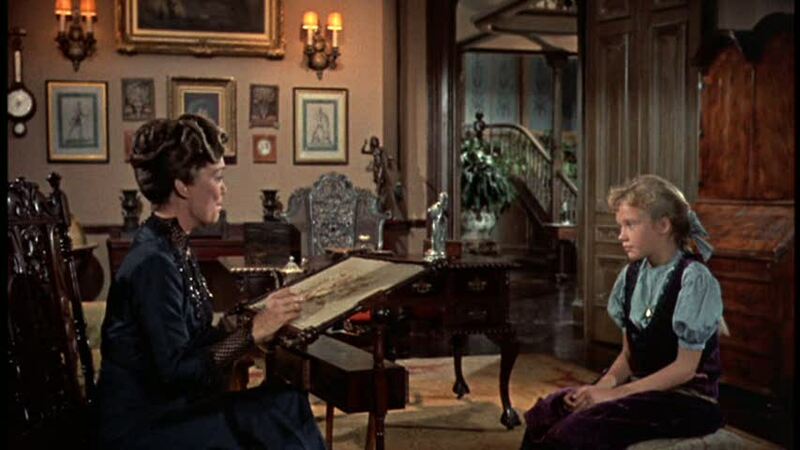 I have heard someone referred to as a Pollyanna but never have seen the movie. I’m going to have to rent it and check it out … thanks for the post! .-= MissCaron´s last blog ..Monday =-. Just a note to say that I really enjoy your posts. I don’t stop by regularly, but I always try to catch up when I come by! Thanks – I know it’s a lot of work. Great house! My Mom and Dad used to live right across the street. .-= Renae Moore´s last blog ..One Flu Over… =-. Thank you for putting this all together. 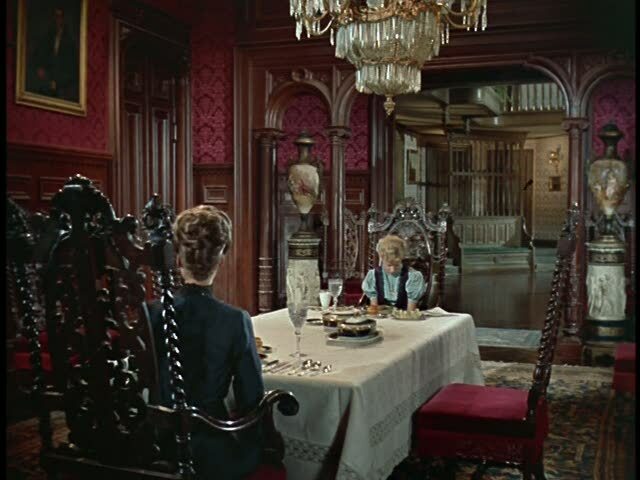 As you know I love all things Victorian. This house is one of the houses from my youth that put me on my track to historical architecture. 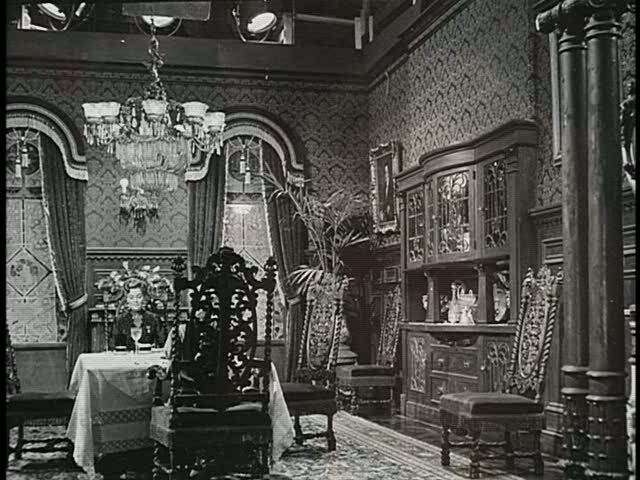 Emil Kiri (set Designer) was a true master and duplicating this era, Walt Disney used her often, even for his apartment in the Disneyland park (above the fire station) and for Club 33, that he never saw completed before his death. We should mention Sir Peter Ellenshaw matt paintings that had us all convinced for year that its was real 4 story house. 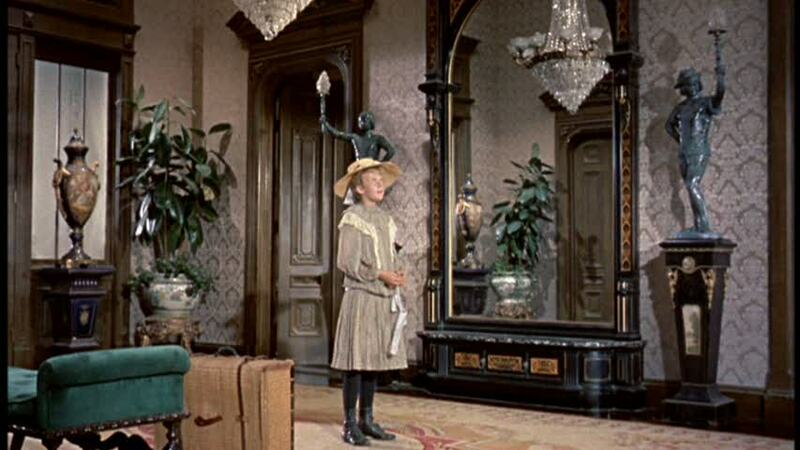 Side note: if you watch “The Happiest Millionair” you see an altererd verion of the Pollyanna set. .-= Derek´s last blog ..This house gets around. =-. Oh, this was a wonderful post! I loved this movie and saw it again on TV not too long ago! Now I loved this olden house too and how interesting to know the top floors were simply painted on! 🙂 Now, I must tell you this! I have always adored Hayley Mills and as a little girl, I wanted to look like her! Thanks for the sweet memories. .-= Shelia´s last blog ..Hi! I’m Back! =-. 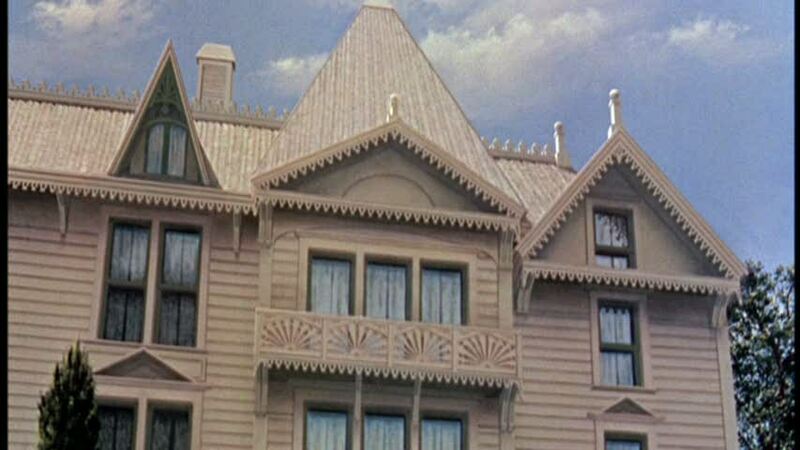 Wow, they made the original into a wonderful mansion in technicolor. Thanks for sharing this great old film! .-= Suzy´s last blog ..Ideas for Party Munchies…. =-. I love your blog. I have it marked as a favorite and read it all the time. This is the first time I have left a comment. I love this movie. Haley Mills is my age and I always thought she was so adorable and cute. This movie was just on cable and I watched it. I will have to get the DVD so I can see the special features. Thanks for sharing the information about the house with us. Your blog is so interesting. I get a kick out of readers asking you questions about shows (i.e., like HGTV) etc. You know so much I guess we think you know about everything or can find out for us. I love houses and enjoy visiting them through your blog. Thanks again!!!! Thanks to Derek, as always, for providing more details about the people behind the movie magic! .-= lylah ledner´s last blog ..For The Love of Flowers =-. thanks for bringing back such fond memories!! .-= kasey´s last blog ..barn boys…. =-. Great post. I love reliving Pollyanna through the sets. Watching The Wonderful World of Disney was always a Sunday evening highlight in my childhood and Pollyanna and Thomasina were two of the best. .-= lindalou´s last blog ..Movie Review #6 =-. .-= Amanda @ Serenity Now´s last blog ..Tasty Tuesday: Incredible Pink Punch =-. 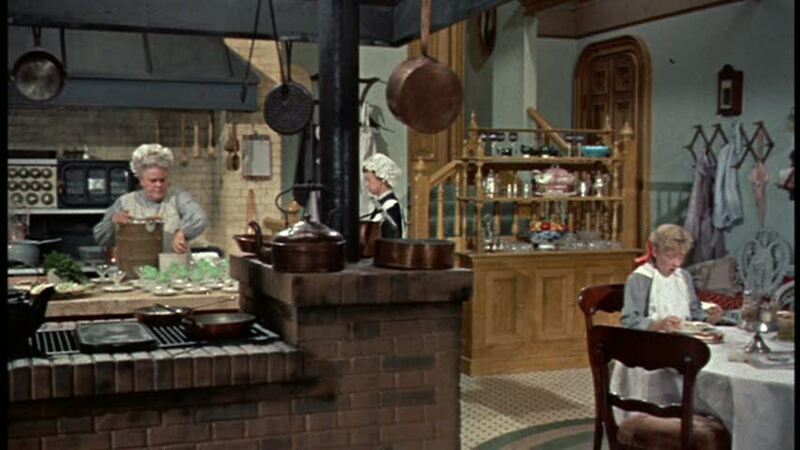 I would love to see a story done on the house in the old movie Meet Me in St. Louis, starring Judy Garland. Kudos to Derek for his contribution! I lovelovelove this move and have since I was a little girl. I was super-excited to see this post because I remembered all the eye-candy that house offered. How crazy that the third story was not real! Pretty ingenious on the special-effects front, I’d say! Julia, thank you SO much for this post. What a treat. .-= bungalowbliss´s last blog ..She’s Ready for her Close-Up! =-. 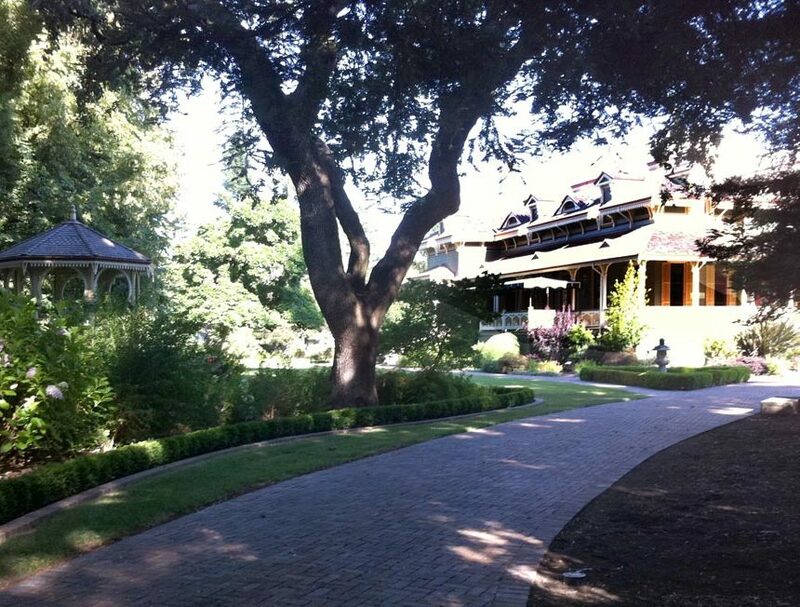 This is a great old house with historic value in Santa Rosa, Sonoma County, California. We have been selected (as MastersTouch Construction) to undertake a complete multi-million dollar extensive restoration and rehabilitation of this 15,000 sq foot home. 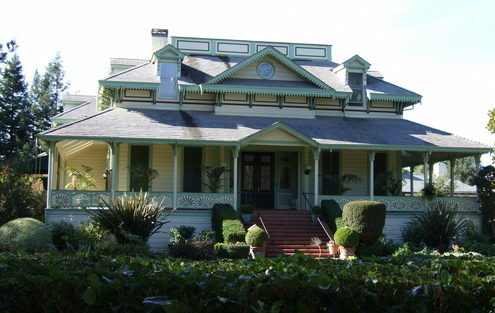 The house is referred to as McDonald Mansion (originally named Mableton when built in 1879). We are in the process of updating our web site to include pictures of the restoration process so people can see more of the house. 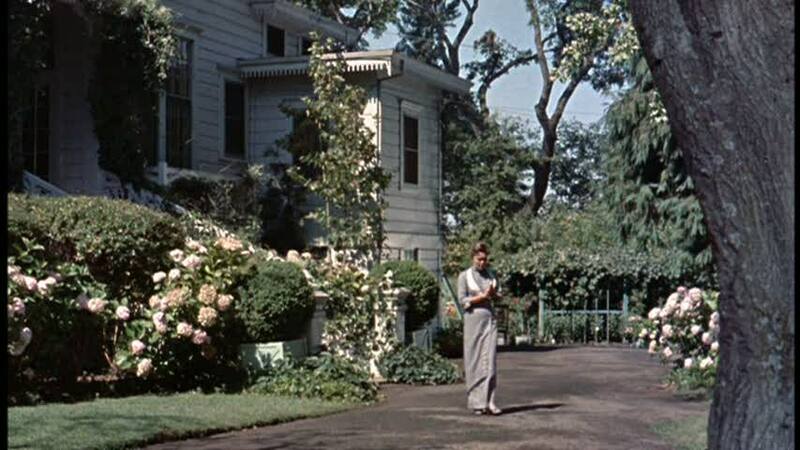 People who walk by the house constantly tell us how much they enjoy the movie Pollyanna and seeing the house. So funny that I saw this post. I was watching family guy with my husband the other day and they were talking about the Glad game…and I told him it was from Pollyanna. I haven’t even thought about this movie in forever! And now it’s shown up in the same week 2 times! Great movie! Beautiful house! Love the post! I must have watched that movie a million times as a kid. I forgot I actually have it on dvd. I need to make my cousin’s kiddos watch next time they’re over. They always just wanna watch stupid Shrek which I hate. No appreciation for the classics. I’m a sucker for a big Victorian house. The real one is just as beautiful as the altered version. 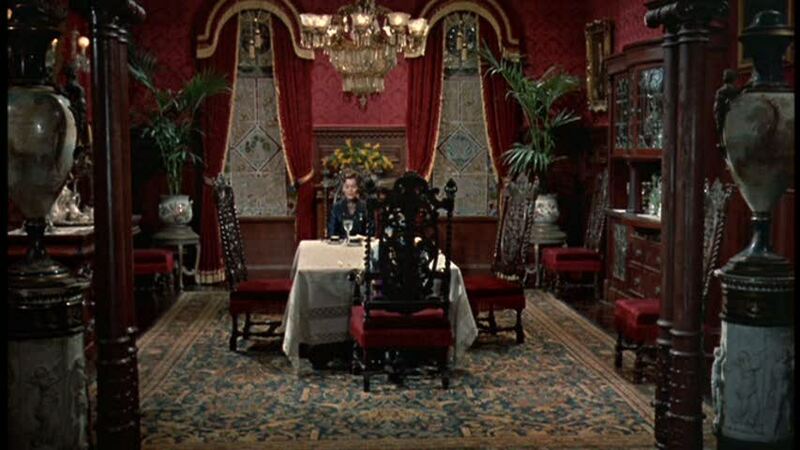 GWTW had those painted sets too IIRC. Amazing how real they look considering they can’t make a monster look real with all the technology they have today. I’ve never forgotten that house. even rented the movie a few years ago to see the house again. Can you even believe that huge sun room? 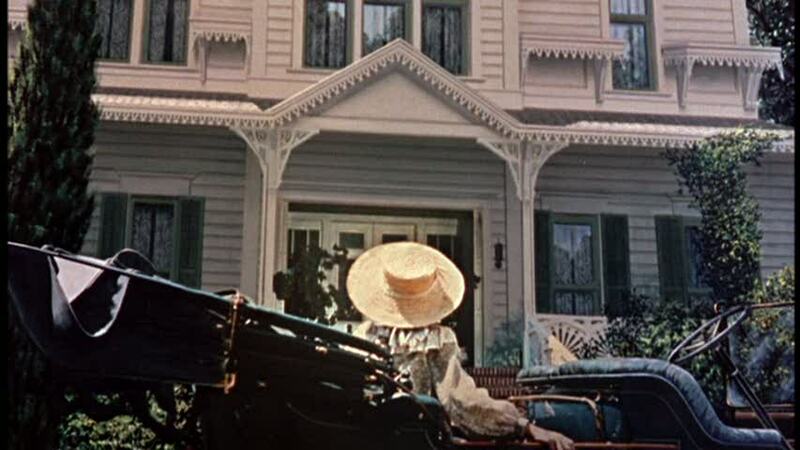 Anyway, a friend posted a pic of a house in Elwood, Indiana that looks just like it, that’s why I came to your site. Here is the link, do not know if it will work. Great movie! 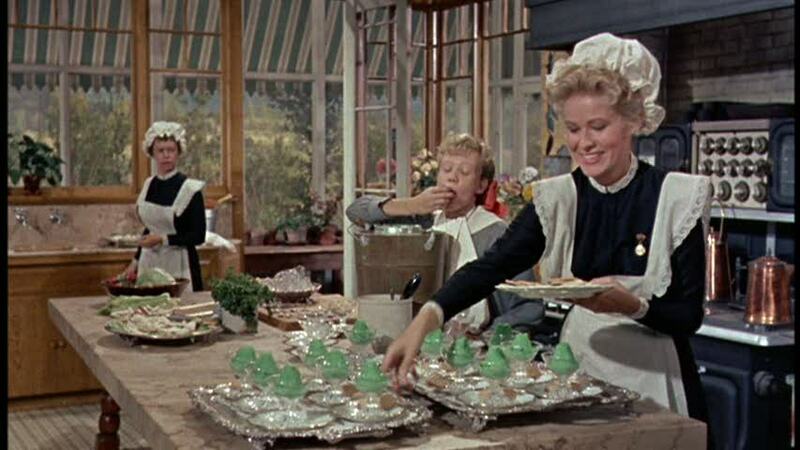 Loved Hayley Mills also. I was looking for the time period of this story and came upon your site. Your post is very interesting and enjoyable. This was the first movie I ever remember being taken to, by my older sister. I was very, very young but I loved it and always remembered it. I’ve only seen the movie three times, the third time being today. I love the time period, the clothing, and all things Victorian as well; perhaps, because I grew up in a house from the 1870s. Growing up watching Walt Disney movies was such a wonderful treat! I have to disagree with you. I don’t think the movie goes on and on. I enjoyed every minute of it. Both many decades ago and now. This was so fascinating to see – thank you!